We're so proud of our collection this season and we think our lookbook really celebrates that feeling. We're also so proud that this year we collaborated with many local Portland designers and makers in creating it. Everything worn by our models was made right here in the Rose City. So, we decided to share our favorite looks with you and provide direct links on how to shop them for yourself! You'll look amazing and, even better, you'll feel amazing because you'll be supporting amazing independent designers, ethically making their goods right here in the U.S.
"Our designs are inspired by origami and the versatile nature of shapes and folds. Put a square cut of cloth on a body and watch it transform. There are no buttons, zippers, or snaps - only ties, wraps, and elastic. Our breathable materials and geometric designs adapt to the wearer because we believe in clothing conforming to the body, not the other way around." You can shop the Poet Dress featured in our lookbook here and the Cove Jumpsuit here. The designs of Lindsey Reif of ReifHaus "are confident, minimal, and playful with subtle details. The pieces never beg for attention, but rather, are the unique and comfortable favorites that garner compliments from your friends." We couldn't agree more. Laurs Kemp writes that her designs are inspired by "the cinema and the feminine gaze." We love the unique detail of her Rowan Coat in Daikon that we shot in our SS17 lookbook. It was"inspired by "liner coats" that have cut-outs under the arms to prevent bunching when you layer. This piece is made from cream-colored quilted cotton, and it has French seams, rounded raglan sleeves, and half-moon pockets in the side seams. It's an ideal layering piece that can be worn over thick sweaters or under warm top coats, or as a light jacket in Spring." Megan Novak created Golden Dinosaur Studio to be a lifestyle brand that features seasonal apparel and custom creations. 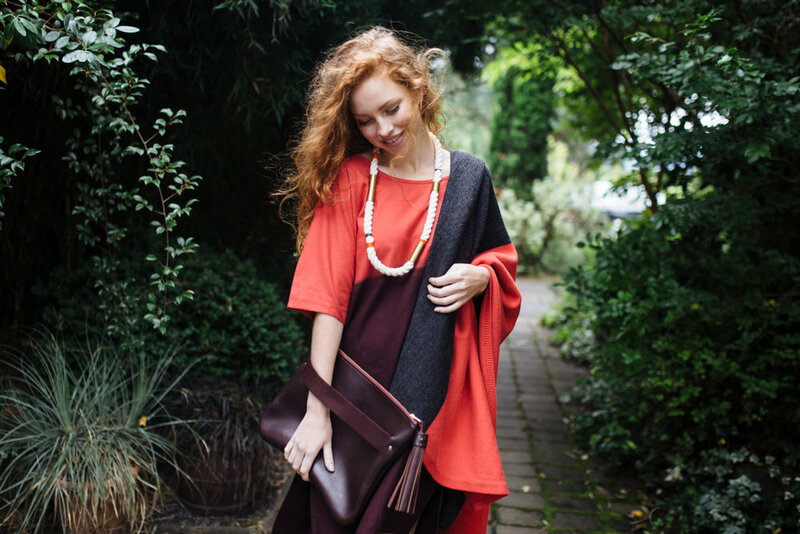 She is "inspired by the simplicity of raw and organic materials, the intensity of natural dyes that yield saturated, one-of-a-kind results, and the peaceful, majestic beauty of the Pacific Northwest, where she now calls home." We think her beautiful NuMu dress in Cobalt Ombre best exemplifies this inspiration, reminding us of the beauty of the Oregon Coast. Shop the NuMu dress here. Rachel Corry of Rachel Sees Snail Shoes "makes fun, casual shoes, one pair at a time. RSSS believes in sustainable choices, working small, learning about the history and practices of shoe craft, and empowering people to make their own shoes." You can shop her shoes here. Or, sign up to take a class to learn how to make your own shoes here. We are so excited and honored to be featured in Issue 03 of Woven titled: The Maker's Impression. It's a beautifully crafted, curated and photographed issue created by an amazingly talented team. The company we share in this issue is truly humbling. Makers and artists that we have loved and admired for years, such as Ace & Jig and Cobra Rock Boot Company. "... capture the stories of makers, artists, and thinkers. It is founded upon the idea that what we often lack in ourselves, we find in others, and through their own sharing of their lives. May these stories serve to inspire and articulate the unspoken desires of your hearts. " Learn more about Woven and order your own copy of Issue 03 here. Given the alarming rise in hate speech and crime, Minnie + George will now be donating 10% of all its retail sales to the Southern Poverty Law Center. Monitor hate groups and other extremists throughout the United States and expose their activities to the public, the media and law enforcement. To reduce prejudice, improve intergroup relations and supporting equitable school experiences for our nation's children. Seek justice for the most vulnerable people in society. If you would like to make a direct donation to the SPLC, you can do so here. Or, go here to learn about other ways to give. This is just a first, small step for Minnie + George. We will be doing more in the coming weeks, months and years. We'd love to learn about other organizations and businesses dedicated to social and environmental justice, so please feel free to share, in the comment section below, ones that you feel passionate about and would like to see our business involved with in the future. At Minnie + George, we love accessories (Okay, we're actually obsessed). Hats, jewelry, scarves, and, obviously handbags. But, there's a special place in our hearts for footwear. Beautiful, hand-crafted shoes can elevate a wardrobe for decades. There are some amazing, talented shoemakers here in the U.S., creating quality footwear. Here are our a few of our favorite styles and makers for Fall. And, as a bonus, we've made fantasy pairings from our Minnie + George fall collection. We love these leopard print, calf-hair sneakers by L.A. company, Zuzii. They're chic but comfortable. We think our Circle Cross Body Bag in our limited edition color, Sienna, makes the perfect pairing for these sneaks. You can find these made-in-L.A. shoes here. Oh, Sevilla Smith! How we love you! Her handcrafted footwear (made in Philly) has been a long-time inspiration. We think the back lacing make these black booties something special. 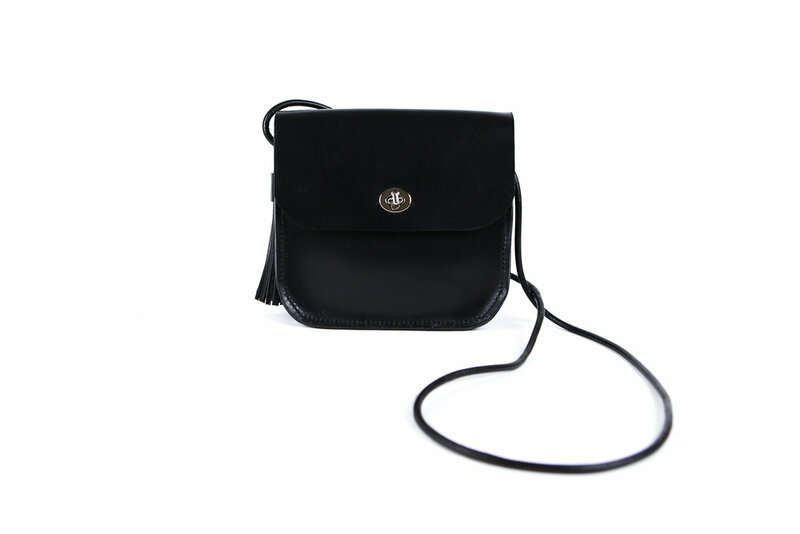 Paired with our classic Small Cross Body Bag or Envelope Clutch would set off any outfit. Shop these shoes here. Local Portland, OR designer Rachel Cory of Rachel Sees Snail Shoes makes these cuties, which we love in natural vegetable-tanned leather. We think they are a perfect pairing with our Standard Tote and Belt. Shop the shoes here. Texas shoe-making duo Cobra Rock Boots are drool worthy. So, we think they work well with our show stopper, Carryall Tote. Shop their incredible boots here. We couldn't decide which bag we loved more for these beautiful clogs by San Francisco label Bryr Studio. We love both the Standard Satchel and Double Clutch for these beauties. Shop them here. We're so proud of our collection this season and we think our lookbook really celebrates that feeling. We're also so proud that this year we collaborated with many local Portland designers and makers in creating it. Everything worn by our models (including their makeup) was made right here in the Rose City. Portland Cosmetic Company, Hue Noir, gave us quite the swag bag of goodies for our shoot. Our favorite was their lipstick color, Vixen, that model Caroline slayed in. Shop it here. And, that hat! You can stop by Shop Boswell on SE 7th & Morrison and meet designer Brookes Boswell, who designs and hand-shapes this and other beauties. Find this hat here. Check out Kacie's latest blog post featuring SW Portland shop, WM Goods and the Minnie + George Hair-On Bucket Bag. Local Portland, OR fashion blogger, Kacie Cone, is a Minnie + George favorite, a muse, and our earliest vocal fan. She was the first blogger to write about our work and post pics of our bags on social media. She was the inspiration behind our first lookbook--a collaboration with her fellow fashion/style bloggers around the U.S.--which was our first successful marketing campaigns. It's hard to put into words what that kind of support means to us. There simply aren't enough thank you's. So, all we can do is share the love and encourage everyone to follow Kacie on social media (@kaciecone) and to check out her website here. I'm always so inspired by people who value their most valuable tool, their hands. Upon learning more about Raleigh Denim Workshop, I also felt such an affinity to their story, with so many parallels between my own journey to starting Minnie + George and their own--From starting this business on my kitchen table in my apartment, to sourcing challenges, to economic hurdles, to learning the craft by doing the craft. I would really encourage everyone to check them out and consider supporting this awesome Maker Made in the USA company when you need a need pair of jeans. Also, be sure to check out our Makers We Love page. The making of our Spring lookbook was a such a wonderful combination of creativity and good old fashioned teamwork. The result was so much more than we could have ever imagined or hoped for. So we just wanted to share some behind the scenes pics of the incredible team that made it happen: Candace Molatore, our gifted photographer, and Kasslah Holdsclaw & Janae Ball our beautiful models. Thanks to each of you for bringing the SS16 collection to such wonderful and vibrant life. Candance took on every role in this shoot. In addition to being the photographer, she was the artistic director, lead stylist, and DJ who did a great job of selecting tunes that kept us all lively even after hours of shooting. Janae and Kassalah were the perfect muses for this season's collection. They brought the budding life and energy of Spring into the studio and into every photo. We asked our creator, L.A. Caldwell where she gets her inspiration, and what it is that keeps her going during the creative process. 1) Purpose. I've done a lot of different things in my life--I've traveled the world. I've taught English in 4 different countries. I've worked as a professional florist. I've been a retail salesperson. I've been a restaurant server. I've been a personal stylist. I've been an administrative assistant at a small New England College. I did all those things in an effort to figure out what not only what I wanted to do, but what I was meant to do. When I finished making my first collection for Minnie + George, my search was over. 2) Mission- I walked into a boutique near my house that I love to browse around. I picked up a pretty basic leather tote bag. It was $600. Now, I'm not going to speculate as to whether the tote was worth the price, that's not for me to say. But, I knew that I wanted to create things that were financially accessible to most people. We all talk about the importance of shopping small, of not feeding the corporate retail beasts who help to create the working poor in our society, but the truth is, most of us are priced out of the ability to do so. I want to create hand-crafted goods that the average person can afford and be proud of using in their daily lives. The ability to make healthier, ethical consumer choices should not be the exclusive domain of the wealthy. 3) Love- I make because I love making. I love how much I learn during every step of the making process, from concept, design, pattern, sample to finished product. I love connecting my hands to something. I love the amount of time it takes to make something well. I love the amount of me that goes into every single step of making. I love the amount of love and support I receive from those who love me. I love the sense of pride in my own work I feel when I make something. To paraphrase a Tribe Called Quest, "I do it for the love, y'all. I do it all for the love." I'm a maker. I love it. And, no matter what, I'll keep making.